This video is very much behind the scenes and is the only video footage that we know of that gives an over-view of the whole event. This is amateur footage and the date is showing on-screen throughout. It proved to be brilliant victories for Ken “Flex” Wheeler, Vickie Gates and Kelly Ryan. 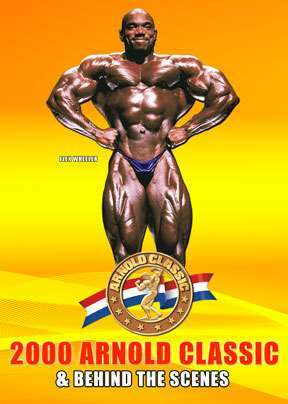 The 2000 Arnold Classic was the highlight of the 12th annual Arnold Schwarzenegger Fitness Weekend, held in Columbus, Ohio February 25-27, 2000. We have just discovered this fascinating amateur footage shot by one of our associates, Jon Davie at the 2000 Arnold Classic. This video is very much behind the scenes and is the only video footage that we know of that gives an over-view of the whole event. This is amateur footage and the date is showing on-screen throughout. However this does not detract from this unique and historic glimpse of Arnold Classic history. It proved to be brilliant victories for Ken “Flex” Wheeler, Vickie Gates and Kelly Ryan. The action starts in the Pump Room and the camera follows the event from pumping and posing to on-stage at the Prejudging to many routines and the awards. A fascinating look back in time at this 12th Arnold Classic contest in this brand new first time release.